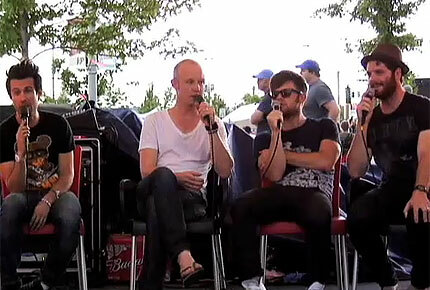 The Fray, 3OH!3, Ani DiFranco, and six more sat down with SPIN this past weekend and we've got the videos to prove it! Those of us not fortunate enough to be out in Colorado for the Mile High Festival this past weekend watching Tool’s first performance in eighteen months or Gogol Bordello’s crowd-surfing gypsy-punk can catch up on the excitement with SPIN’s artist interviews, filmed live at the Budweiser Lager Sessions area. Whether it’s 3OH!3 dishing about Lil’ Jon’s condom collection or Galactic describing “gay-bounce” music, check out our video interviews with artists from the weekend’s Mile High Festival in Denver. We also chatted with the Fray, India.Arie, Jet, Matt Nathanson, Ani DiFranco, the Duke Spirit, and Needtobreathe, who gave us a stripped-down performance!